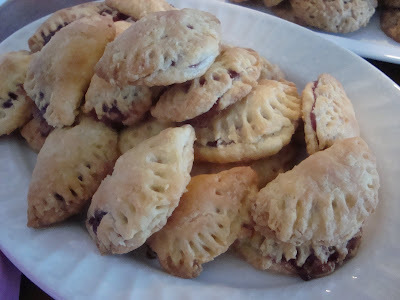 Although not exactly Chilean, these sweet empanadas did add some South American flair to our dessert table. I prepared this dessert for my Chilean wine & dine event and they were a hit! You could use any fruit preserves you want so feel free to try out several kinds. DAY BEFORE: Cream butter and cream cheese together until smoothly blended. Beat in the flour. Shape dough into a smooth ball, wrap in foil or cling wrap, and refrigerate overnight or up to a week. 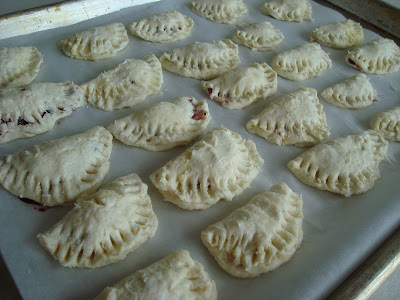 AT BAKING TIME: Remove dough from refrigerator 30 minutes before using. Start heating oven to 375 degrees F (190 degrees C). Roll chilled dough thin. Cut with 3 or 4 inch round cookie cutter. 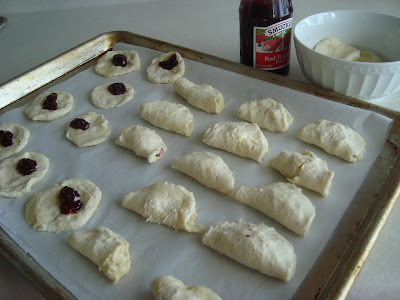 Place small spoonful of jam in center of each round, moisten edges with water. Fold round over and press edges together. Bake on ungreased cookie sheet 15 to 20 minutes. Immediately roll in sugar mixed with cinnamon (traditional) OR in confectioners' sugar if preferred. They look yummy! Can't wait to give this recipe a try! What a delicious dessert! My family would adore these. Oh these look delicious! I have so many raspberries in my back yard, this would be a perfect way to use them up! Yum! Sweet desert. Can't stop myself going through each and every blog of yours which made me a great fan of yours. Keep it up the good work.